You got inspiration from magazines, on-line sites and TV shows. You have the style, and the information. However, your initial dreams are limited by your own design experience and the products that you know about. When it is time to put all together and make visible your inspiration it is likely that you need professional help for considering alternative designs and materials. With Design Edge the result is a well-designed space that is a combination of our designer’s knowledge and experience and what our customers truly like after considering all their options. 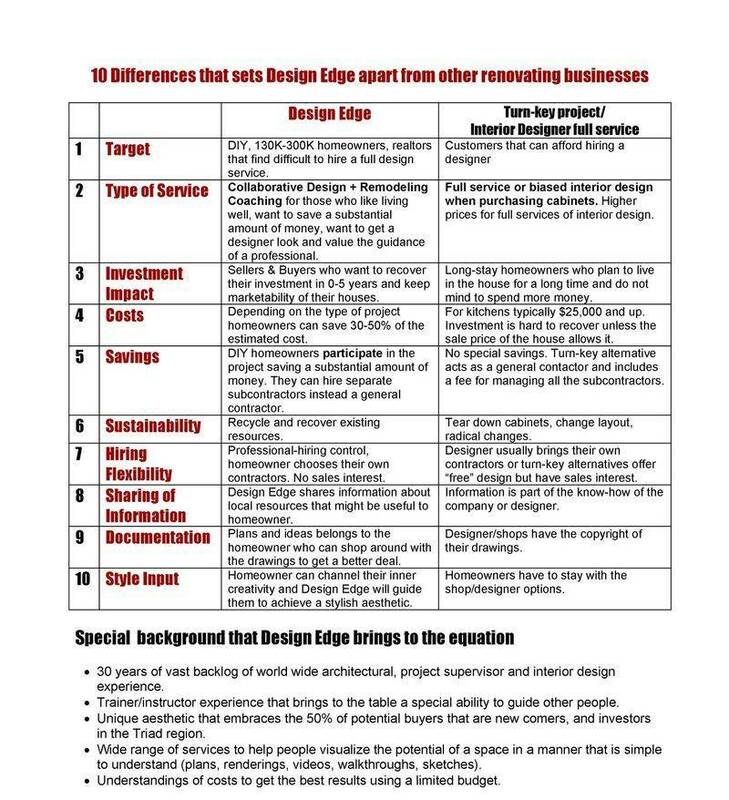 For Design Edge it is all about a great remodeling experience in which our clients have the opportunity to actively participate in the design process. 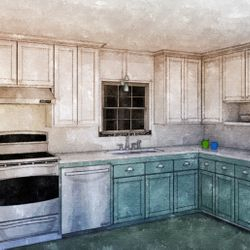 Collaborative Interior Design and Remodeling Coaching is all about schooling, guiding, and sharing our knowledge, international background and experience. At the end you get what you want and really need. There are no impositions and arbitraries to any particular sales interest. 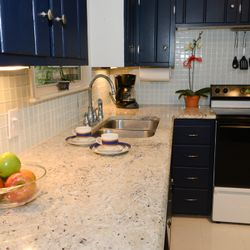 We are unbias professionals who guarantee you a hassle-free and on-a-budget renovation. 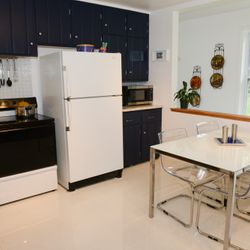 Design Edge shows you ways to make a good investment in your house. 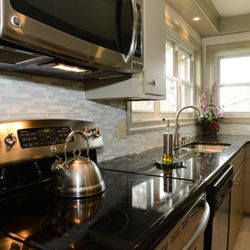 We elevate the look and functionality of any project avoiding you big DIY mistakes. 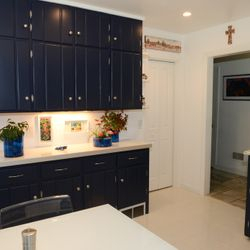 Collaborative Design and Remodeling Coaching are new approaches to traditional full-service interior and architecture design that adds the principles of design to DIY project to look professionally done. 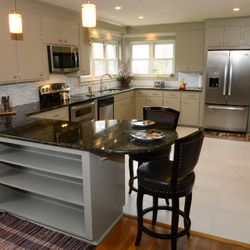 The collaborative design and remodeling coaching give the possibility to homeowners that would never hire a full time designer of staying on budget, avoid making expensive mistakes and get a pleasing-to-the eye look that only a designer can achieve. 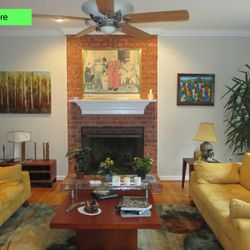 Note: Most of the pictures in our website reflect what our clients accomplished with our help within their budget. 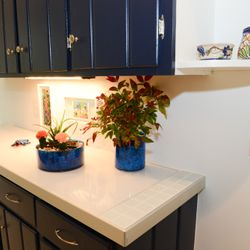 Either because you are selling, buying or staying, from color advice to a complete addition, Design Edge guides your renovating dreams within your means. 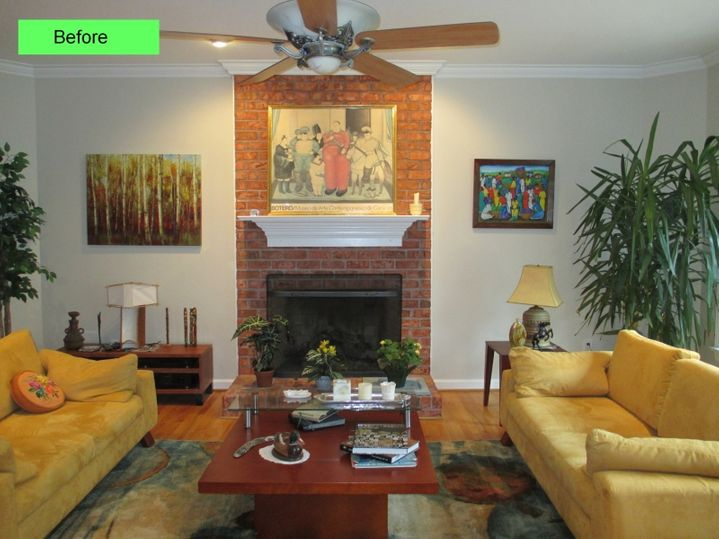 Design Edge picked some colors that could match with their furniture.With our help the homeowners changed completely the mood of the room. Before: old, dark, crowded, not functional. The owner received an estimate of $29,000. With our help she accomplished an update for $10,300. 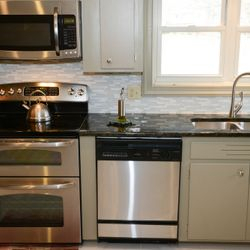 A beadboard cabinet with black hinges, gray Formica and several vinyl layers on the floor was what the homeowner had to work with. 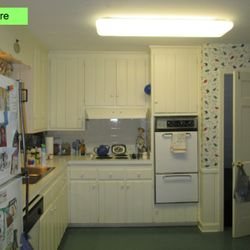 The owner received an estimate of $23,000 to update the kitchen. 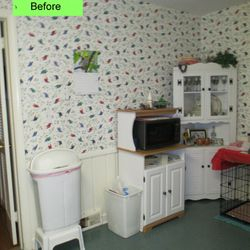 With our help she could accomplish an update spending only $7,300. 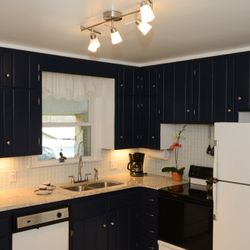 A solid dark navy blue color was chosen for the cabinets and very light colors for backsplash, floor and countertop to oppose the selection of the dark blue color. 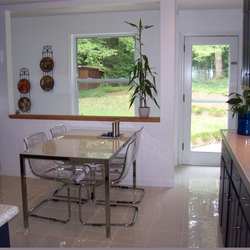 To bring more light from the backyard to the room a polished white floor tile was selected. A modern tempered glass table with transparent chairs provide the sensation of a much bigger space. 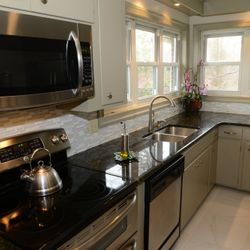 An opening and a window were added to complete the brightness of the kitchen. 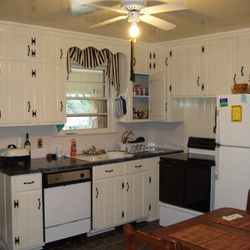 The homeowners wanted white shaker doors. 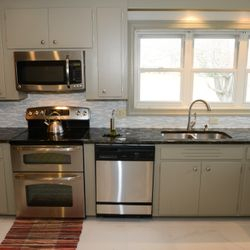 We completed their selection with a green granite and a backsplash made on glass and marble tiles. 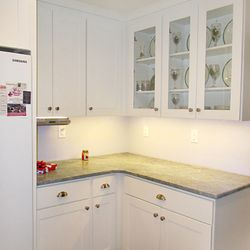 The refrigerator was relocated and new cabinets were built to allow more storage and to show a beautiful china. As the final cost turned to be lower than the expected they spend extra money in changing to harwood floor. 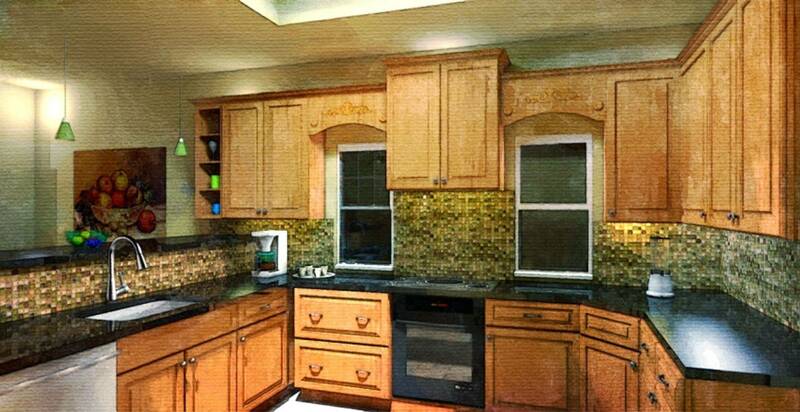 Remodel with a limited budget. We teach you how and guide you along the process. 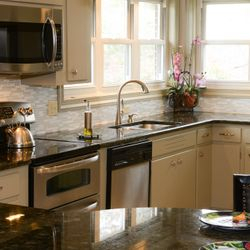 For kitchens no more than 5% of the value of your home should be in your kitchen; it is hard to recover more value than that. 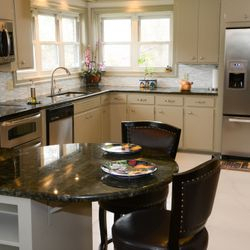 Our Collaborative Design & Remodeling Coaching for residential spaces will set your home apart. Convert your house into workplace, stay-cation, gym and more and increase its marketability. 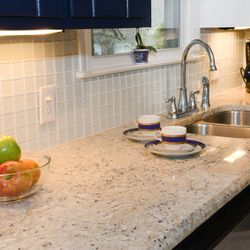 Whether you have new life requirements, want a fresh look, or are thinking of putting your house on the market, we can help you design your home’s new look, narrow down your choices, make wise design decisions, and be as environmentally friendly as possible. 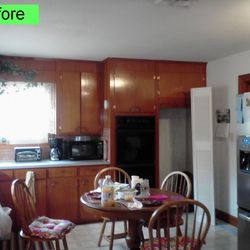 You will be surprised how much we can help in just a couple of hours! 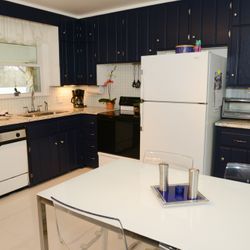 A consultation/diagnostic to evaluate your space and its promise. Short and cost-effective sessions and a clear action plan for you to follow. 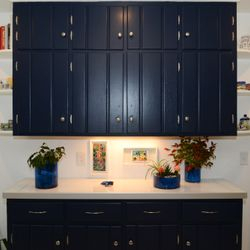 Design, advice and ideas for your property’s unique features so that your DIY project will look professionally done. 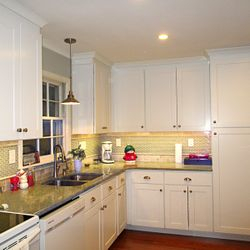 Advice on cabinetry, lighting, hardware, color schemes, and finishes without the markup! 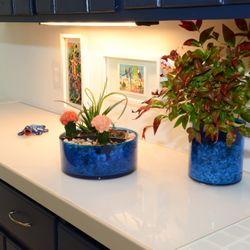 Ideas for reinventing, recycling, and/or recovering materials you already have so that the cost of your update is almost lower than your first price reduction in case you want to sell or have a limited budget. 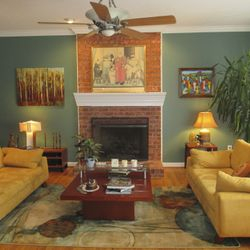 Unique color palettes beyond the usual choices to help make your home stand out. Field measurements and drawings that stay with you. Help with project management and problem solving. Shopping trips to local retailers and selection of finishes. Referrals to resources that are normally unavailable to individuals. Research, analysis, and comparisons of different construction estimates to help you make the decisions that are right for your project. You select and hire the contractor. You choose the help that you need!! When you do part of the work, it saves you money and helps you stay on budget. Like any coach, Design Edge will help you to crystallize your ideas channel your inspiration and creativity, and bring out the best of your room. Our service rates can be adjusted to any budget. Great spaces do not happen by accident. We can help.